My favorite poem is one by Emily Dickinson, titled "Hope is the Thing With Feathers." The reason that I love it is two-fold: one, it's a really easy poem to memorize. And secondly, the lyrics are very rhythmic and soothing. "Hope is the thing with feathers," Dickinson writes, "that perches in the soul. And sings the tune without the words, and never stops at all." The imagery of hope as a bird is one that I've always really been drawn to (as evidenced, too, by my love for I Know Why the Caged Bird Sings). And hope is an image that Arrow has laid as its base this entire season. The Green Arrow was supposed to be the very embodiment of hope — he was going to be the one to do things in a different way; to be the light that the citizens of Star(ling) City so desperately needed. And when the writers careened off the rails and decided that this season needed to be about magic, Team Arrow constantly failing, and a secret kid story, that hope got lost. The show tried to recover it in the final few episodes of the season, including its finale titled "Schism." So let's talk about Olicity, hope, and why I think it's best that (almost) everyone left town in the end. When I first entered the Arrow fandom, it was because my Twitter friends and followers had talked non-stop about the relationship between Oliver Queen and Felicity Smoak. The first episode that I ever watched live was "Unthinkable," because these friends had been hyping the finale so much. And when I began to love Arrow, it wasn't because of Olicity. That, certainly, is a part of why I love the show. But they're not the whole reason I fell in love with the hit CW series about a vigilante and his team. When this show is at its best, it isn't because of the romance between Oliver and Felicity. Again, that is only a piece of why it is great. No, when Arrow is great it is because it manages to intricately balance suspense, action, witty dialogue, romance, and character development. If you've read any of my reviews from this season, you'll know that I'm absolutely and completely on board with the show not getting Oliver and Felicity back together until next season. I was seriously hoping that they wouldn't put them back together again. Why, you might ask? If I'm an Olicity shipper, I logically should want them to be back together as soon as possible, right? Don't I miss their banter? Don't I miss their heart eyes and kisses? Wouldn't Arrow simply be great again if Olicity was back together? The answer to that last question is a resounding "no," and — in fact — if Arrow was to put Oliver and Felicity back together, romantically, in "Schism," it would have undercut everything that was once great about them. It would cheapen their romance, making Felicity's quick about-face justified by the big life and death scrape they just survived. In putting them back together, the writers would be doing the characters a huge disservice and removing part of what makes Felicity so strong. Felicity did not walk away from Oliver because she was being spiteful. She is not staying separated from him because she wants to hurt him deeply. She expressed recently how painful it was to let him go. The reason that Felicity is keeping a guarded wall around her heart is because she needs to. She's slowly — very slowly — letting Oliver back in; she's giving him a chance to pursue her again in the way that she deserved to be pursued in the first place — no holds barred, bearing all truth and vulnerability. Oliver and Felicity cannot be put back together with a glue stick. They can't be duct taped back together either. That's hasty and rushed. That's telling us that Oliver can choose to lie to Felicity and she'll be okay after a few weeks. I absolutely do want these two to get back together, but rushing that relationship and improperly pacing it would be absolutely detrimental to the characters and their romantic narrative. I don't want them to have a hook-up in the season finale because the world is ending so they feel like they should. That's grossly underestimating the depths of their relationship and the layers of pain that are still present. I've been a part of a lot of fandoms throughout my time on the Internet. I've been involved in fandom for the better part of 14 years. And the one truth that I absolutely always land on is this — any couple worth waiting for should be waited for. Oliver and Felicity's love story is still relatively new. It's still fresh and it's still young. And there is a lot of good in that. There are a lot of potential stories and possible character development that could happen (that could have been true this season too, but I won't rehash the whole "baby mama drama" of it all again). And so they deserve to have a slower burn. I trusted the writers to wait until it was the right time to put them together in the first place, and I trust that whenever they are put back together again, it will be permanent and it will be worth it. I know it can be difficult to wait. I know it might feel like we somehow have earned a romantic Olicity scene (I'll talk more about how that final moment was just what I needed and wanted), or that we deserve one for having to endure all of the pain of this season. But that's not how television works. That's not how writing works. You don't want a creator or a writer to listen exclusively to fans while writing their characters. You want to trust that they have a plan and know what's best for these characters and for this pairing, whether we can see it or not. This season of Arrow has tested my faith in its writing staff a lot, between the unnecessary Olicity drama and the absurd plot threads to erratic characterization. But I don't, for a second, want the writers to listen to my ideas and my tweets. I want my television shows to be smarter and better than whatever whim I'm currently attached to. So whether it takes two years, or twenty episodes, I'm ready to wait for Oliver and Felicity to get back together. Because I have hope that when they do, it'll be done better (or at least better than this season). I opened talking about the importance of hope throughout this season, and I want to continue a little bit by talking about why hope is so important in Oliver's trajectory, and why I'm grateful that season five is beginning with Oliver and Felicity not together (this is a little bit of a continuation from the section above, so bear with me for a moment). Felicity is everyone's beacon of hope. She's the one who inspires laughter and joy from the people around her. She saves them with speeches (as evidenced by the fact that she saved everyone by appealing to the hope and goodness still left within Cooper) and she saves them with her unwavering faith and loyalty. But the problem is this — you cannot rely on another person to be your everything. You cannot harness someone else's beacon of hope; you have to become your own. I think that's something that a lot of people, including me on occasion, struggle with when it comes to Felicity and Oliver's relationship. We want her to always be the one encouraging him to find another way. And we know she will — we know Felicity Smoak will do all that is within her power to make the world a better place and to make the people around her better. But she cannot be their everything. She cannot be Oliver's only hope or source of light. I'm glad that, a few episodes ago, Oliver said that he heard everyone else's voices when he briefly countered Darhk's magic. That means that Oliver is learning to rely on more than just one person for his source of light and hope. And yet it's still problematic if Oliver cannot harness his own light. It's not good or healthy to rely on someone for everything. No matter how sappy and romantic it sounds, Felicity cannot be Oliver's entire world — not, at least, when it comes to the boundaries between light and darkness. And that's why Oliver becoming mayor is actually pretty important to me. Oliver gave a rousing speech to the public — he became a beacon of hope for them. And at Laurel's grave, Felicity explained that Oliver is fracturing inwardly. There are two parts of him, at war: darkness and light. The acknowledgement of that is the first step to dealing with the darkness. The second step that Oliver must take next season is harnessing that light within him and not relying on anyone else to do so. That doesn't mean that Felicity can't remind Oliver of what is already within him. She can absolutely speak that truth he needs to hear. But Oliver is going to have to start believing in the existence of his goodness just as much as he believes in the existence of his darkness if he is ever going to be his own beacon of hope. After all of the dust settles from the big showdown between Darhk and Team Arrow, our band of heroes emerges victorious. Oliver kills Darhk, the nuclear warheads are stopped thanks to Curtis and Felicity, and all's well that ends well. ... Except that thankfully Team Arrow remembers all of the tragedy and trauma they've endured over the course of this season and the last. So three key members of the team decide to skip town, leaving only a few remaining in Star(ling) City for the summer. First up, Quentin Lance and Donna Smoak decide to drive off into the sunset together. It's not as sweet as we might hope, reading that sentence — Lance got his old job offered back to him and is removed from suspension, but the thing he dreamed most of being now seems hollow without his family. With Sara gone, flitting through time, and Laurel gone permanently, Star(ling) City doesn't hold much of anything for our former police captain anymore. He and Donna decide to close the chapter on this part of their lives and move on. We know they'll be back, as Lance's wistful look in the rearview mirror and the knowledge of Charlotte Ross' return next season tells us. Nevertheless, it's a fitting end — for now — for the couple. Also leaving town? Thea Queen. I want to pause and say: "PRAISE THE LORD." Thea accurately assesses the fact that she's been a little off since the Lazarus Pit, and hasn't had the time or chance to determine who she is outside of her alter ego, Speedy. She's also come face-to-face with the darkness inside of her, and the pain that this darkness has resulted in. So she doesn't know where she is headed, but she knows that if Laurel was still alive, she would tell her to find herself and get out before whatever humanity is within her is gone for good. Thea? Good for you, babe. You've realized how traumatized you actually are, and how desperately you need to take a break from the place that feeds you darkness and pain every single night. Also leaving town is John Diggle. He tells Oliver that after his conversation with Lyla about killing Andy in cold blood, he's not really sure who he is anymore either. He used to be the person who doled out advice to Oliver. And now, he's the one who is in desperate need of good advice. I honestly thought that I had Dig all figured out — he and Lyla and baby Sara would probably drive off to Coast City and spend hiatus doing normal, family stuff. But as the episode ended, it panned to Dig — in uniform — packing his bags and preparing to head off to the service. I have absolutely no idea what's to come with his story, but I will say that I understand it. Dig's primary identity has been "soldier" (it's the reason Lyla told him that he was able to pull that trigger on Andy), and Dig is a little bit lost right now in terms of who he is and what he's done. Rather than processing that in any sort of normal way, like therapy, Dig is going off to fight in battles and try to remember why he became a soldier in the first place. Unfortunately, that leaves a still-broken-up Oliver and Felicity left in Star(ling) City together. I say "unfortunately," because I had desperately hoped that Felicity would at least leave town for a little vacation. Maybe she could visit her friends in Central City (though from what I hear, they're dealing with a lot to begin with), or friends elsewhere. Or maybe, just maybe, she could visit a therapist. I desperately want this show to address Felicity's trauma next season, bu I know that they'll likely gloss over it. Because Felicity — the woman who usually doesn't have to make big calls on missions or life-and-death decisions — doomed hundreds of thousands of people to death, and watched the man she used to love die right in front of her eyes. Add to that the tragic circumstances of Laurel's death which I doubt she's adequately dealt with, and you have a young woman in pain and desperate need of help. Let's be clear here: I think EVERYONE ON TEAM ARROW NEEDS TO GO TO SEE A THERAPIST. Between Oliver's PTSD, Thea's personality crisis and thinly-veiled rage, Felicity's trauma, and Dig's pain and anger, the team has more than enough to talk about. I just desperately wish the show would address the ramifications of the decisions they had to make. Not, like, brush them off with an OTA joke (I cringed because that was just so out of place and not at all tasteful... and just another example of the show thinking we'd be placated with a cute Felicity line). And maybe Felicity uses her babbling and humor as a defense mechanism the same way Oliver uses his Arrow suit as a way to process his grief and anger. But I just want this show to actually address all of these issues instead of pretending our characters don't have to deal with the consequences of their actions. All in all, this season of Arrow was pretty rough. There were some great moments early on and some good episodes throughout. But when examining the series for plot and character development, I find this season to be severely lacking. There was closure in some forms for the characters, but not others (I honestly don't need any "closure" for Oliver/Felicity since theirs will be an ongoing story), and the entire message and central theme of the season was so weak. Arrow did set up its fifth season theme — schism — in the show's final moments, but if we're being honest, it just feels like a worse re-tread of season three's theme of identity. This finale wasn't great, but it also wasn't bad. It just kind of was. While there were some elements and resolutions that I liked, the entire theme of hope just fell completely off the rails to me. There wasn't enough consistency in that deliverance this season, and it got muddied down by all of the drama and magic and crossover events. I'm really sad Darhk is dead, because Neal McDonough absolutely slayed it as this season's Big Bad. I was so apprehensive but he turned out to be the best and most consistent character in this uneven season. And that's saying something. McDonough clearly had an absolute blast playing this character and I'll miss him. You know who I won't miss? FLASHBACK CHICK. PRAISE THE LORD, WE'RE (PROBABLY) OFF THE ISLAND. Take me to Russia, where the clothes are warm and there probably are more relevant stories to be found. A few minutes into the episode, I tweeted about surmising that "Schism" would end up having the same moral that Doctor Who's "Last of the Time Lords" did with Martha getting everyone in the world to think about the name of The Doctor at the same time to save them. 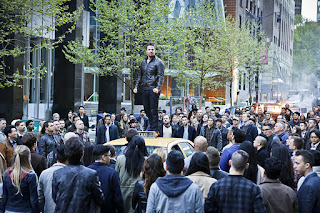 And yes, apparently Oliver received the strength to defeat Darhk from the hope of people in the city. He absorbed their life force! Lance and Felicity's little moment was touching. Apparently it took Curtis and his husband three terrorist attacks to contemplate leaving the city. THREE. THREE. I really appreciated all of the insanely random mentions of Laurel in tonight's episode and everyone basing major life decisions on what she would say. 99% sure the roof where Curtis and Felicity stopped a nuclear warhead was also the roof that the Legends of Tomorrow team just killed Vandal Savage on last week. "Thanks, unless you were aiming at me." "At this point, I honestly can't tell." Same, Thea. Same. "Our business here is concluded. ... Unless it's not." YES, AMANDA WALLER. IT IS CONCLUDED. WE ARE DONE ON THE ISLAND. D-O-N-E. I enjoyed the meta reference of Oliver's official mayoral election taking place in August. Oh, right! 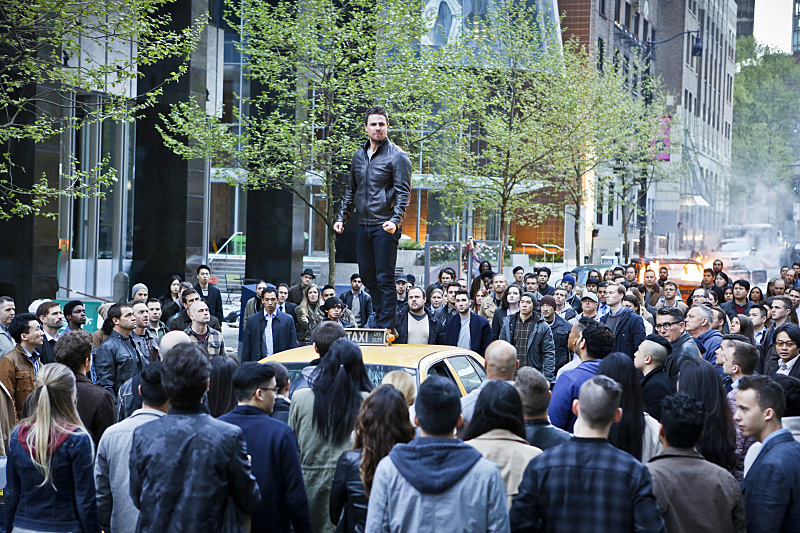 Since Oliver gave a rousing speech, he's now the mayor. I wonder why that never worked for Jeff Winger on Community. "You thought I was leaving too. Not a chance." I loved that final shot of Oliver and Felicity looking at the suits in the lair. I still wish she would have left town too, but it was a nice visual reminder that no matter what their relationship status, they have each others' backs for now. It's a stepping stone to Oliver becoming more trustworthy to her (and me) again. Great review! I think you've accurately captured everything I felt/feel about this episode and the season as a whole. Couldn't agree more about Oliver and Felicity not getting back together before the season ended. The show bungled the launch of this couple (basically having them break up before really getting together in season three, followed by the beginnings of their actual relationship taking place off screen, to the ludicrous baby mama storyline this season), and the only hope for them to get it right is to earn it by slowly building it back up. We've now had four seasons of each season's theme ultimately boiling down to some variation on the theme of Oliver coming to terms with his inner 'darkness'…sigh. Hopefully in season five the writers find a way to move the show beyond this theme (and find a way to make Malcolm Merlyn pay for his crimes, but I digress). This season wasn't quite as awful as season three, which nearly made me quit watching the show, but it had some equally frustrating story arcs and overall I feel kind of meh about it. Excellent review and written so well in such a short amount of time! I really hope that Arrow writers and EP's listen to Stephen Amell, who has been quite vocal recently about what needs to happen in Season five. More OTA, more street fighting, etc. Basically, getting back to the basics of season two, which, in my opinion, was its strongest season. The first half of S4 started off fairly strong and promising, then took a nose dive with the start of baby mama drama in episode eight. In my opinion, it was downhill from there and the show never quite recovered. There was way too much going on and not enough follow through. Lots of dangling stories, like Donna walking out on Noah, for what reason, we aren't exactly sure, and then dropping it altogether, seemingly. Felicity is hugging her dad one minute and not too many minutes later, her mother asks him to leave and he does, with Felicity not even batting an eye. What? These kind of things need to stop on Arrow. I do take serious issue with Felicity being as chipper as she was despite losing her job, losing her friend, LL, 10's of thousands being killed, etc. If Arrow doesn't dive into the fallout of all of that somehow, I'll be disappointed too. So much has now happened to her, it's not at all realistic that she would be this okay. Yes, Felicity should have left. I agree to your reasons and I'll add one: There is no way you can work in close quarters with someone you still love, with no one else around, for months and months at a time, and not get back together, or, at the very least, start sleeping together. As someone on Twitter mentioned, it's even less believable than magic and time travel (via Barry in crossover) Arrow tried to pull off this year. Fans will have to believe it, however, because that's the story Arrow is trying to sell us. It's fairly weak writing, in my opinion. I didn't need to see them back together but I did hope for a bit more hopeful talk before she left to spend the summer with her dad or friends, etc., regrouping and spending time by herself, decompressing and healing from all that has happened this year. Yes, maybe even seeing a therapist. If writers are smart and don't want to dive into a whole arc on Felicity facing with her true emotions, they could have her, at some point very early on, mention she's been in therapy all summer which will imply she has been addressing some of her issues. I'd be ok with that, though they definitely have created possible storylines for her given all that happened this year. As a military spouse, I take issue with Digg reenlisting after he retired. A quick fact check was in order here as it's not very plausible. My Army officer husband was pissed I even asked him about it. It annoys soldiers to no end when a show or movie can't get a very simple fact like this checked before trying to sell a story like this. If he did actually reenlist, somehow, he can't just leave the Army again whenever he wants. So silly way to send him off the team. As far as everyone leaving, it falls flat only b/c it's not the series finale and we know they'll all be back. I felt no emotion around it. My immediate gut reaction was, "Ok. See you all in October." I think it's fairly safe to assume there will be an Olicity reconciliation early in S5 unless Amell plans on sticking around past a sixth season, which I think it unlikely. While they do have issues to resolve, my very causally watching female friends say the show feels a bit disjointed now that they are broken up b/c the years long looks, touches, banter, etc. that gave the show a spark in times of darkness, is gone. Hmm, I have many thoughts. I still need to put some of them in order. However, I will say that I really liked the fact that Felicity stayed. Not for relationship reasons but for character reasons. Felicity has been dealing with a lot of pain around the question of leaving. She left Oliver and then she left the team (for understandable reasons). There is no way of knowing whether Laurel would have lived if Felicity had been on the team during the prison break. But I am almost certain it feels like the truth to Felicity. Add in the fact that they have a major battle against the big bad and, even more powerful with magic now, and this time she is with the team and this time they didn't lose any team members. That is going to be a big deal to Felicity. Then add in the fact that she has been dealing her whole life with the ramifications of her father "leaving" her. And again, he has left without talking to her at all. Even though they haven't shown much fallout from that (and I wish they would have had the time or taken the time to do so) it would certainly be in her mind. Simply put, Felicity has quite complicated emotional issues around the concepts of staying and leaving. I was not surprised at all that she decided to stay. I think she is making some points to herself in that sense, even if she is only doing it subconsciously. She has lots of reasons to leave but she will stay. It could be a major growth opportunity for her. Everything has gone down the crapper: job, relationships, the city, major destruction. And instead of running away or pulling back she is going to work through it. I really feel there are good times and reasons for pulling back but I also think that there are times when one needs to grit the teeth and stick it out. Only Felicity can now what is right for her in that regard. Also, I'm not really sure that it is inevitable that she and Oliver wouldn't be able to stay apart while working closely together. Really? I think it is entirely possible for two people to do that. But what really makes it reasonable for me is the emotional fallout that Felicity especially will be experiencing. I also wish we could see some of that and feel that we probably won't. You are right on with the therapy suggestion. I have wanted that for ages but that's not really what action shows do. My best friend is a therapist and I firmly believe the process is beneficial for anyone, not just those dealing with major trauma. That being said, Felicity is dealing with major trauma. It would be entirely reasonable for her to experience some real psychological repercussions. And I'm suggesting depression. Now, everyone's experience of depression is different but in general it doesn't mean feeling sad. It means not being able to feel anything, complete numbness. If that were the case Felicity might conceptually know that she loves Oliver but she wouldn't be able to experience any of the emotions much less a relationship. It is not easy to be close to someone going through depression and if Oliver is a support and a friend during that for Felicity it will be a real growth opportunity for his character too and a way to be her hope and light while she can't feel any of it. Now, that is just the way that I would write it but it ticks a lot of boxes I think. In any case I like imagining they two of them just working together and letting the relationship stuff lie until they have gotten to a better place in their own selves. Oh, and what happend to Darkh's daughter? Did they just leave her in that creepy killing room? After watching her dad kill a bunch of Argos agents, then disappear in a fight and then what... Boy if anyone needs to get into therapy it's that kid. And Oliver did promise to look after her so are they just going to drop that thread? I would feel more heartwarmed about the city supporting the Green Arrow if they didn't look like such a bloodthirsty crowd which reminded me of coliseums full of crowds being entertained by people or animals fighting to the death. That just creeps me out. I think you have some good points. It all depends on the direction the writers want to go. Yes, Oliver being there for her while she's depressed over recent events, helping her come out of it, being her rock, could bring them back together. Except, the finale didn't show her depressed at all. So, it's really unclear what the summer holds for those two or each individually. Ideally, we'll come back with the message that they both spent some time alone. Maybe they each went on a vacation, or one of them did. Lots of great things we could learn happened over the summer to them individually. I'm really tired of the same old TV tropes. I don't feel that Arrow writers are particularly strong. So, I'm not setting the standard too high going into S5. This was a partially weak season, in my opinion, and if it doesn't get back to season two quality early in S5, I'll probably hit pause on the show until it gets better or abandon it altogether if it doesn't. I think my biggest problem is there never seemed to be any weight to the events. I think ultimately that the writing and directing and the connections to the broader DC/CW universe is wearing them out. This just lacked energy and suspense. What is particularly frustrating is how badly the speech was. I know what you're feeling right now. I'm feeling it too. The feeling of helplessness. Of Hopelessness. I don't know how we even begin to process what might happen to us right now, but there are a few things I do know. I know that this city has been through tough times before, and we have pulled through. We survived the undertaking. We survived the siege. We survived the outbreak, and some how, some way, we will survive this. A friend of mine told me, Living in Star City takes a certain type of tenacity. But we do live here. Because this is our home. This is our home! It is our friends, our families, our lives, and we will not - we will not- throw those precious gifts away by descending into chaos. We will look to each other for hope. We will cling to each other for strength. If we do that, no matters what happens, we can all stand here united. The word choices were the main problem. Here is an better version. I know what you're feeling right now. I feel it too. I feel helpless, hopeless, and I don't know how we will survive. But I know that this city has been through tough times before, and we are still here. We survived the undertaking. We survived the siege. We survived the outbreak, and some how, some way, we survived. A friend said, “Living in Star City takes a certain type of tenacity.” But we do live here, because this is our home. This is our home! It is our friends, our families, our lives, and we will not - we will not- throw these precious things away by descending into chaos. We will look to each other for hope. We will cling to each other for strength. If we do that, no matters what happens, we can all stand united. My main concern for S5 is what happened on Flash. Unless the first episode back is a Speed Force version of It's a Wonderful Life, nothing here mattered. Literally. None of it happened, and knowing that is a possible reason why this finale just felt bland. As to the ending, meh. It seems right. Of all the bad notes they have hit this season, it's nice they didn't try to hit all of them as a solution to a meh season. I think you are right on about the strain that is evident in their decision to connect all these shows. I know that conceptually it gets a lot of people excited and the crossovers have provided good ratings and enjoyable scenes. I just think they are trying to have it both ways, connected when its fun but not connected if they have to have some sort of consistency or overall cohesive story. Some viewers watch all the DC shows, some do not and if they want to spend their time and energy on those connections it has to be really carefully done. And their own plotting and writing has to be tight enough and powerful enough to bear the weight. I don't think it is a coincidence that the introduction of Barry on Arrow's season 2 felt really effortless. Arrow was having a really good year with a really well-plotted arc. Barry worked into that as well as being his own charming self. But it hasn't worked as well as things have gotten more complex and I feel it's turning into dead weight for all of them, especially Arrow. I'm not sure what they were trying to do with the whole schism idea. If that's the theme they were building towards it just didn't resonate with me. If they wanted to really state that killing is sometimes necessary by bringing in Amanda Waller's statements, Taiana's wish to die, Dig killing his brother, Oliver killing Darhk I wish that would have been a more consistent idea this year. It might have been interesting to see Oliver really considering his no-kill vow and if that is right in all situations. I would have enjoyed a good treatment of that argument. But it feels like I'm grasping at that rather than being presented with a cohesive argument by the story. And if their theme was hope then they watered it down quite a bit by all the things they tried to do this year. Meh is a good word for it. Lance- I totally get it. The job he loves must seem so empty after the loss of Laurel. He has a lot to figure out and examining his life outside of the job seems a good move. Thea- Ditto. She has only gone from adrenaline to action to fighting to rage and round and round. There has to be something else to her life or she will spiral down. Diggle- this one is more confusing to me. I'm not sure that entering a war zone results in anyone feeling more healthy or clear about their lives. The show always presented the soldier Diggle as someone deeply damaged. Back in season 1 he told Felicity that he didn't know if he was a good person after Afghanistan and that working with Oliver was what helped him feel like a good person again. That doesn't bode well for his decision to go back. I really want some freaking resolution to the whole Malcolm Merlyn thing. As much as I enjoy me some Barrowman keeping that character around without much of a purpose is really irritating. Was there this same inner conflict after killing R'as last year? Everyone seemed okay with that decision and there was absolutely no talk of "Was that the right thing?" How is it different this time? Is it because Oliver was killing out of anger about Laurel? Lance called it justice but Felicity called it cold blood. If they want me to feel it this year I wish there was some follow through from Oliver's decision last year. The schism idea fell very flat. So the team split. It's not the series finale, for one. For two, we already know all these characters will be back next season. So, it didn't have an emotional impact on me at all. You can only pull off a successfully, emotionally charged finale like that when the audience has no idea who is coming back next season and cast hasn't already talked about how OTA will be back stronger than ever in S5. I felt nothing at all during finale because there were no heart-to-hearts. When the world is going to end, you have heart-to-hearts. I'm a military wife and the whole Diggle rejoining the Army is absolutely laughable. He's retired, so he can't just reenlist. He wouldn't just leave his family behind - when you join the Army, your family moves with you to your assigned duty station. He would have a four year Army commitment that he can't get out of just b/c Oliver Queen/Green Arrow needs help in October. So, no, I felt nothing about him leaving either because I know too much about the military. I couldn't get on board with any of it. Likely we won't ever hear about DD's daughter again. B/c Arrow has no idea what to do with her. They'll pretend she never existed.